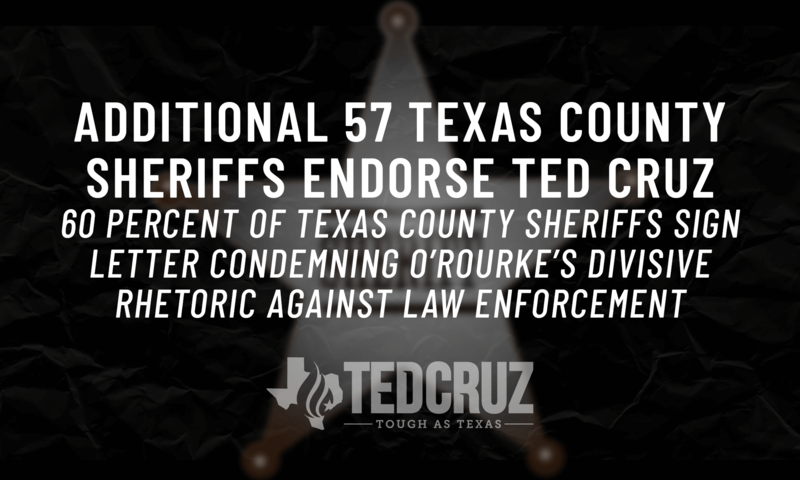 HOUSTON, Texas – A total of 153 Texas County Sheriffs––including six *Democrats––signed on to a letter condemning Congressman Beto O’Rourke’s divisive rhetoric against law enforcement and endorsing Sen. Ted Cruz for re-election. This is an increase of 57 Sheriffs from less than a week ago. This new total means a clear majority (60%) of the Sheriffs across Texas have endorsed Sen. Ted Cruz. The original letter may be viewed here and text of the letter may be found below. We write to express our grave reservations regarding Congressman and current U.S. Senate candidate Beto O’Rourke. O’Rourke recently made disparaging and offensive comments against the brave men and women who comprise Texas’ law enforcement community, and his voting record as a U.S. Representative is equally as troubling to those of us who protect and serve every day. As law enforcement officers, we put our lives on the line each day to protect and serve the Texas communities where we live, work and raise our families. We know first hand that being in law enforcement is more challenging in today’s times than at almost any point in history. And sadly, Beto O’Rourke has gone even further than the all-too-familiar rhetoric that inflames anger towards peace officers. That is disgusting, offensive and entirely unacceptable for anyone who wants to represent each of us, and our fellow 28 million Texans. These harmful comments also make it much more difficult for us to maintain the public’s trust and to safely and effectively carry out our duty. As if these terrible statements were not enough, Beto O’Rourke has also taken votes against law enforcement – he voted against legislation that would have stopped President Obama from ignoring federal laws on criminal justice and immigration. He also inexplicably voted in favor of a bill that would have prevented federal funding to provide law enforcement with over $9 million in life-saving equipment. In sharp contrast, Ted Cruz has stood up for our peace officers as our United States Senator. As experienced law enforcement professionals, we believe that nothing is more important than to serve and protect the communities we live in. Ted Cruz understands this – and he is the right choice for our law enforcement community, and we believe, for Texans at large. We are urging all Texans to stand up for law enforcement and vote for Ted Cruz on November 6.